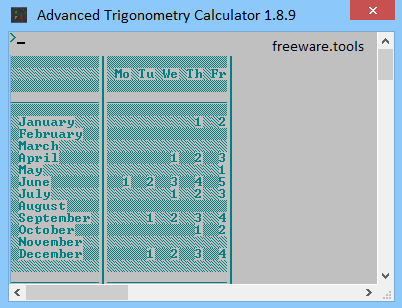 Advanced Trigonometry Calculator is a small, simple, command prompt application specially designed to help you with your trigonometry calculations. Advanced Trigonometry Calculator is an application that will help you solve advanced calculations with scientific notation and amplitudes in positive and negative arguments. It provides users with a full quality calculator and results with decimal or scientific notations. Simply enter your complex math expression on its integrity and in the final press “Enter” button, after some instants the solution for your expression will be displayed. Anyone can use this calculator since the syntax used is very similar with scientific calculators. Advanced Trigonometry Calculator is a straightforward and effective software solution that aims to provide you with a reliable means of performing mathematical operations with the least amount of effort, all the while maintaining a high level of precision. It should be noted that the tool only works via a CMD interface, so you will require some basic knowledge of working with Command Prompt in order to fully benefit from what it can offer. The application can also be called up via a command line, as well as the features. Users can take advantage of the command and syntax functions to automatically solve various functions, as well as automatic handle text files. Nonetheless, Advanced Trigonometry Calculator also comes with a hefty help documentation that can provide you with insight into the arguments you can use to obtain the best results. Overall, the application is not difficult to use but it requires a bit of your time to go through all the available commands in order to fully take advantage of its capabilities. Despite its name, the program is capable of executing a wide variety of mathematical operations, but for structuring purposes, these are grouped into ‘Trigonometry’, ‘Hyperbolic’, ‘Digital Signal Processing’, ‘Logarithm’, ‘Arithmetic’ and ‘Statistic’. In what concerns the trigonometry side of the application, the tool is able to calculate sine and cosine, tangent and cotangent, secant and cosecant functions. At the same time, the ‘Hyperbolic’ operations that it can perform refer to solving inverse trigonometric calculations. Advanced Trigonometry Calculator allows you to determine logarithms as well as execute other arithmetic operations (addition, subtraction, multiplication, division, etc.). It can even provide you with statistical calculations. Quadratic equations can be solved in Advanced Trigonometry Calculator, even with a/b/c being complex numbers, fully supported with the Command Prompts. Furthermore, there are commands for restarting the app and resetting the settings, accessing the history file and browsing the source code location. For a detailed list of commands and functions, as well as exemplification of Advanced Trigonometry Calculator’s usage, you can consult the help file provided with the utility, as it enables you to discover its full potential, without having to struggle to figure out how it works. In conclusion, Advanced Trigonometry Calculator is a comprehensive yet accessible application which can assist you in solving difficult mathematical calculations, with just a couple of keystrokes, sparing you from having to resort to heavier software or worse, do them by hand.